Summer is passing quickly and it is time to plan for fall. Stay tuned for some exciting announcements and a back-to-school sale on lessons! It's a new year! Want to learn a new skill? As my calendar starts to fill up, it is time to schedule your private lesson to learn quilting, sewing, or cross-stitching or Punch Needle (pictured above). Learn how to make a bag, a rag quilt, how to paper piece, or anything else you may want to try! Have a very Merry Christmas and wonderful New Year! Classes and lessons will resume January 10th. Private lessons seem to be the most popular right now, so I haven't scheduled any group lessons. I welcome those who would like group lessons to send me an email and when I have enough interest I will put a few together! Please also check out my new website at www.mysimplewalk.com There you will find free patterns, craft videos, recipes and more! The cool weather is here and it is sewing season! Now is a great time to start quilting and prepare for the holidays. Want to do some Christmas shopping and have someone to not only watch your children, but teach them to sew? Want to make some gifts for those you love? Learn to sew, cross stitch, needle punch, or quilt now! Still have some private lesson times available. Now offering Needle Punch classes! 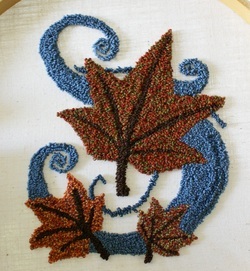 Learn how to create your own patterns and use a Needle Punch! August 31, 2010 - I can't believe it will be September tomorrow! The summer has ended much to quickly, but that means it is time for cooler weather and a new schedule. Please check out the "Classes" page for more information! I now accept orders for Miniature Quilts used in dollhouses and room boxes. You pick the size, colors, and desired pattern! Email me today to talk about your miniature quilt needs! Please click on the "Other Services" tab to find out more services I'm offering! Coming soon - Craft Classes! Have your children ever come to you wanting to do a craft project and you just didn't know what to do, or you didn't want to have to clean up a mess? Well my creative juices are flowing and I'm exploring the idea of craft classes for children! They will be an hour class and I will provide all the supplies and the clean up crew! Please check back for more details or email me today!